Summer orthopedic, water & extreme sport hiking boots protect your dog’s paws from blistering abrasions and other hazards in the heat. Neopaws shoes for the large breed dogs are made of a breathable and durable nylon-mesh with strong rubber soles and extra reinforcement around the toe, sides and heel. They are perfect for protecting your pet while it participates with you in the many outdoor activities during the summer months, in and out of water. Neopaws will protect your pool liners and boat seats too! Also ideal for dragging paws or arthritic dogs who need help with traction indoors. 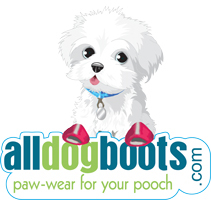 The people at Neopaws, makers of these breathable mesh dog boots believe that protecting you dog's paws is one of the most important things you can do for your pet. If we are lucky, our dogs can live a long time and while they are living that happy life, their paws deserve to be protected from the many dangerous hazards they are exposed to. Neopaws makes orthopedic boots for dogs with conditions like hip dysplasia. These particular kind of Neopaws boots make it more comfortable for them when they go on their walks while protecting their toes from being injured if they drag their paws. They also keep Duke from slipping and sliding on hardwood or tile floors. Neopaws dog shoes are perfect for protection from pollen, burrs, sharp rocks, broken glass, and road chemicals as well as hot roadways and sidewalks from hurting your dogs paws. Think about your floors and furniture when he has been out romping in the snow, mud, or rain. Pull off his boots before he comes in and your floor is safe. If your dog is a swimmer, boots will protect the sides of your pool when he clambers out. 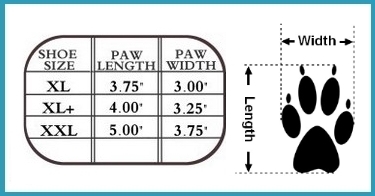 There are really so many reasons to set your dog up some boots from Neopaws, the “Nike” of dog shoes. My 7 year old huge Great Dane (42 inches at the shoulder) drags one of his back feet. He keeps getting an infection because one of his toe nails is always open to the quick and he then bites it. My vet suggested shoes which I thought was odd. I brought the XL plus and put a sock on his foot to prevent rubbing. No more problem. The nail is growing and he leaves it alone. The shoes are durable and I think he likes them. He has been jumping around which he hasn’t done in some time. A little disappointed that these are sold as a set of 2 when most dogs clearly have 4 paws. Ordered the xl-plus per the printed size sheet. Called to order,customer service was excellent. USPS delivered a day sooner than expected. Boots fit well and stay on. Happy with this purchase. We measured wrong the first time, spoke with someone in company who directed me to correct size. We re-ordered, and smaller size fit perfectly! Returning wrong size boots today. Great customer service from this company. I loved the first pair so much, I bought a second!